Is It Time to Abandon Battlestar Galactica (The Board Game)? While Battlestar Galactica: The Board Game (BSG) is not my favorite game, it’s definitely in my top 10. Like several of the others, it’s a long game and there’s just something I love about being taken to another world for hours on end. Regardless, Battlestar Galactica is definitely one of the greatest board games ever. If a board game is that good, people will find a way to play it. 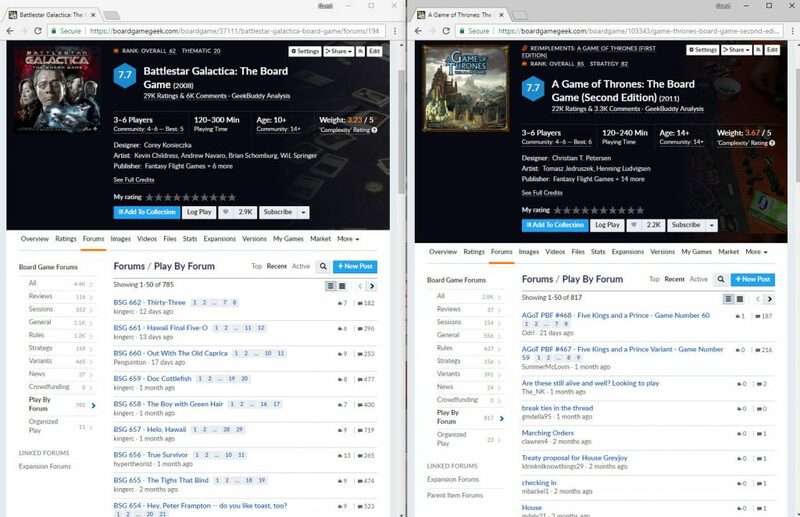 If you frequently visit BoardGameGeek, you’ll notice that their forums can be pretty active. What you might not have noticed is that many games have a Play by Forum section. Dedicated gamers don’t like to let distance or lack of time stop them from playing, so they look for new opponents and ways to play. Thanks to Fantasy Flight Games’ generous cooperative stance with the BSG community, as long as you own a copy of the game, you can play it in the forum with other game owners. Battlestar Galactica: The Board Game is one of the most played games on BoardGameGeek’s forums. Since March 2009, over 600 games have been verifiably played this way. That doesn’t count the harder to quantify number of variant games, which stray too far from the original rules. The only game that came close is A Game of Thrones: The Board Game (Second Edition) with 460 plays. Most other games on the forums had fewer than 10 plays. Very active forums for these games. Does your favorite have a Play by Forum? To play BSG by forum, it’s usually a minimum of 5 players committing to one action per day for 2-3 months. Lasting around 3 hours in person, the Play by Forum (PBF) game lives with you for months. That’s dedication. What makes Battlestar Galactica: The Board Game so great that people would go to such effort to play? Its licensed theme is part of it. The show was about a race of robotic AI called Cylons. They were at war with humanity, entered a truce, and recreated themselves into flawless human-like copies. The Cylons broke the truce by infiltrating the planetary defense systems and almost wiping out humanity by nuking all 12 planets at once. The surviving humans found themselves on various ragtag ships being guarded by the Battlestar Galactica, a derelict ship, and its stubborn crew. Unfortunately, Cylons were hiding among the fleet. The game really captures the feeling of the first season of the show. After I started playing the game, I was driven to rewatch the entire series again. I know of other players who were inspired to watch the show for the first time after playing the game. Just like on the show, you feel that humanity is on the brink of extinction constantly fighting against the odds with a growing sense of paranoia unless you’re one of the saboteurs hiding a contemptuous grin. These feelings are unreasonably fun and addictive. Length. It takes around 3 hours to play unless you get a fairly bad draw (two Cylons before the first half of the game or just a really bad run of events). Most people simply don’t have the time to play a game for 3 hours and even more don’t want to. Though, a 3 hour tour on the Battlestar Galactica is far shorter than a game of Twilight Imperium, one of the next best space games out there. 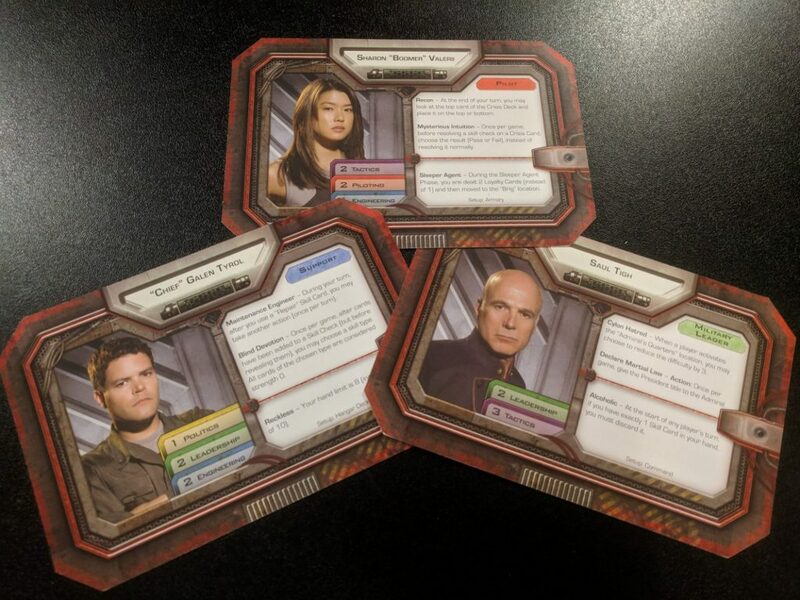 Two Cylons in leadership positions can make for a short game. License. First, the show is growing old. Battlestar Galactica is a 2004 reboot of a 1978 show. Fewer and fewer people are going to know about the show and thus seek out the game. Those who manage to stumble onto this game will have an increasingly harder time finding the show, which leads into the second problem with the license. Fantasy Flight Games acquired the license from the show owners and speculation abounds that they could not or would not renew it. The gaming company no longer prints the game and is tight-lipped about why. Due to its popularity, there are very few copies that haven’t been sold or opened. Even used copies can go for $200. That’s more expensive than Gloomhaven or Twilight Imperium IV brand new and it has a whole lot less in the box than these games. Seeing how you should own a copy to play via forum, the PBF community can no longer grow quickly. With such demand, you would think that Fantasy Flight Games would reprint and cash in, but licensing may prohibit it. Semi-Cooperativeness. Sometimes Battlestar Galactica gets introduced as a cooperative game with traitor(s). But it’s a bit more complicated than that. 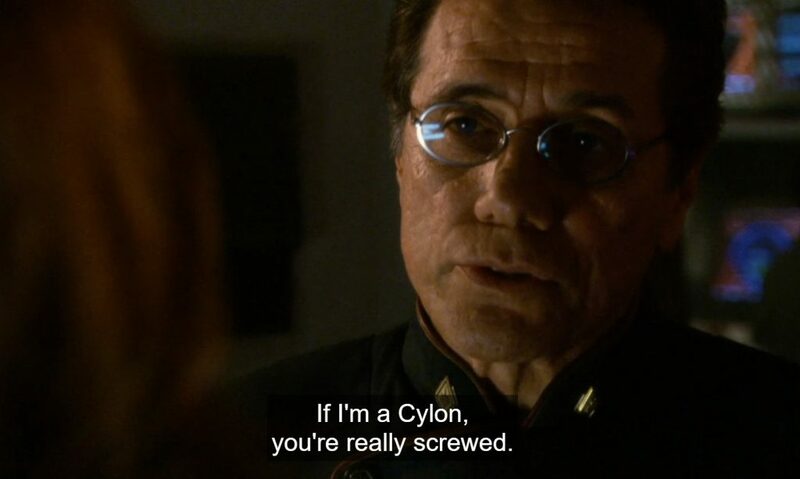 Unless you pull a “You are a Cylon” card at the very beginning, you can’t be certain of your own loyalty, which means you really don’t know whose team you are on. If you turn Cylon in the second half of the game, you’ll regret having played too pro-Human in the first half. Truthfully, you are on Team You, and You benefit by being cautiously selfish until the second half. You want to be prepared to be on either team and be in control if possible. Some people may be turned off by that. Sometimes even a Cylon doesn’t know whose team she’s on. Despite these shortcomings, I urge you to join the crew of the Battlestar Galactica on its journey to save humanity. Find a way to play this game. Several times. Due to some of the randomness, it takes more than one game to get a handle on it. Maybe you’ll get lucky and find a copy in a local gaming store at a reasonable price. If so, grab that copy! If you do, you’ll enjoy a great game and be inspired to watch a great show, possibly again. Whether you get to or not, there is an upcoming similar game that may fix its flaws. Warehouse 13: The Board Game, based on another SyFy show, will have a hidden traitor and use dice, much like a variant speed version of BSG. Warehouse 13 was another great show and early reviews suggest its gaming namesake captures the heart of the show very well. Warehouse 13 should play quicker than BSG and be fully cooperative — no shifting loyalties. Here’s hoping it’ll be easier to get to the table.